analysis procedures. They perform separations by entrapping particulate within the random matrix of cellulose fibers within the depth of the media. This media family is also widely used in methods to prepare samples for further testing using many types of instrumentation. Due to the hardened surface,this material is suited for smear and wipes applications as well. These ashless filter papers are manufactured from refined pulp and linters. They are acid washed and have an extremely low ash content of <0.01%. This unique media is an ultra-high purity cellulose filter paper. The proprietary production methods employed produce a media which demonstrates a highly durable surface texture without the high level of organic extractables common to traditional acid-hardening processes. The alpha cellulose content is a minimum of 97.5% or above and is single source. This media demonstrates excellent lot-to-lot reproducibility. Material chemistries are verified against a standard using GC techniques prior to papermaking process. 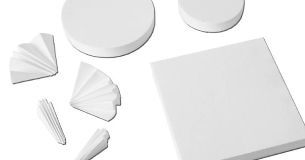 This media is a smooth surface, bright white cellulose filter paper. The material is manufactured from carefully selected, fully bleached and chemically-free pure cellulose fiber without additives or binder. General laboratory blotting applications require smooth, flat paper stock demonstrating high absorption and wicking characteristics. Some of these applications include: membrane backing, sample collection and conveyance of pastes and gels, wicking media for blot apparatus, draw down tests of liquid samples such as paints and adhesives. The media is also specified in TAPPI T-205 sp-06-Forming handsheets for physical tests of pulp, section 3.9-"Blotting paper." Also specified in Development of USPS laboratory and pilot-scale testing protocols, 200, Appendix 1A II, no.8, Materials, "Blotters". Rapidity: 25s/1.0 mL minimum-according to TAPPI T432 cm-09 Modified testing for western blot rapidity at 35ml/60 sec. Paper making machines in flat bed, slant bed, high speed fourdrinier and rotary forming styles. Web widths from 24 inch (60.9cm) to 72 inch (182.8cm). Basis weights from 8lb to 138lb @ 3000ft2 (13g/m2 to 225g/m2). Binder free, Binder burn off, Acrylic, PVA and hybrid chemistries. Gantry mounted traversing densitometry as well as most other high-resolution verification sensors. Static pressure, mixed and multi-stage head boxes. Binderless, mixed box, spray on and pulper-saturation style binder introduction. Single and multi-stage vacuum boxes. Several screen variants for very high consistency formation. Wet stream or dry deckle trim. Unique end of machine board cut-off capability for very high density, high basis weight celluloses. High speed rotary knife sheeting (+/- 0.03125 inch). Low speed, multi roll CNC sheeting (+/- 0.03125 inch). Low tensile strength sheeting capabilities handling the most challenging binderless glass grades to 60 inch web width. Vacuum stack counting with laser verification and tab insertion minimum 5 sheet count. Narrow roll slitting down to 1/4inch web width even in low tensile glass microfiber. Shaftless rewind with core ID's down to 1/2inch ID. Die cutting in manual, semi-automatic and automatic repeating modes. Slow speed, platen, clicker, c-frame, fixed tool and bottom-up presses. Tonnage from 1 to 140ton in hydraulic and mechanical types. Narrow web <5.125 inch (13cm) rotary die cutting with unique "zero-tensile" capabilities, inline micro perforation and rotary parts cut-off. Vacuum in-field parts removal. Programmable guillotine cutters from 30 to 44 inch (76.2cm – 111.76cm) width. Spreading table station for woven fabrics fabrication. Hole drilling, slotting and complex notching. Laminating via heat set, single and dual surface in web widths of 60 inch.